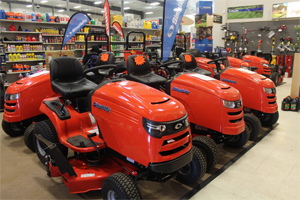 Whether you have acres of green grass or a city lot, Stoughton Lumber has a variety of lawn mowers to fit your needs. We carry self propelled, walk behind push mowers as well as riding mowers and zero-turns. Our service department will make sure your equipment continues to run perfectly. We handle routine maintenance, warranty service, and just about any repair that needs to be done. We service any type of equipment, whether purchased in our store or not, for any brand. Our technicians have over 25 years of experience in small engine repair and can fix almost anything, regardless of the age of the equipment. Spring is a great time to perform your mower’s maintenance needs and get them taken care of before the growing season. That way, you’ll be ready to roll when the growth of your lawn hits full stride. Not only does a properly maintained mower perform better, but it will also last longer and be more reliable over the course of its life. Bag on Demand and so much more. First multi-patented suspension system for the riding lawn mower, making it possible to cut faster even on uneven terrain. Utilizes quarter-inch steel at stress zones and protects areas prone to impact from curbs or transporting between jobs. Simplicity - Simplicity® Lawn Tractors feature the best cutting result using the exclusive Free Floating™ Mower Deck with full-width rear rollers and pivoting front axle. Their lawn mowers deliver precision cutting performance and the ability to create ballpark-style lawn striping patterns.